CHICAGO (Sporting Alert) — The Chicago Bulls have revealed that guard Kirk Hinrich will not play in Game 1 of the Eastern Conference first round game against the Milwaukee Bucks on Saturday and is doubtful for Game 2 as well. The battle will be here at the United Center. Hinrich, who missed the last two games of the regular season, was listed as questionable for the game because of a hyperextended left knee, which forced him to miss practice sessions. However head coach Tom Thibodeau confirmed that the veteran guard will not feature in Saturday’s game, adding after the team’s shoot around session that he is unsure as to when the 34-year-old will be able to return. “(The rehab progression) has sort of plateaued off,” Thibodeau told reporters. “So he’s been stuck for a few days now. 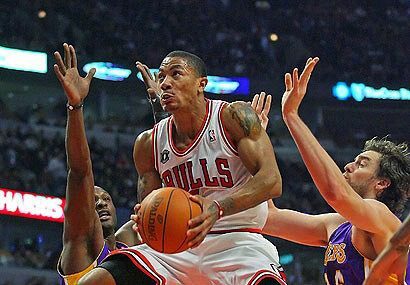 Meanwhile, star point guard Derrick Rose, who is now fully fit after coming back from a right knee surgery that forced him to sit out a major part of the regular season, will return to playoff basketball for the first-time in 3 years and Thibodeau is delighted for his leader. “It’s great. All that he’s been through, just to have him back, this was another tough season that was able to persevere and get through it,” said Thibodeau. Rose managed to play in the last five games of the regular season and averaged 11.6 points in those games. He scored 22 points, eight assists, six rebounds and three steals in a 114-107 victory over the Philadelphia 76ers. “He felt fortunate in the end to get a handful of games before the playoffs began for him to just good acclimated again,” said Thibodeau. Thibodeau also said that there will not be restricted minutes put on Rose, who sat out the second half of the regular season finale against the Atlanta Hawks because of a sore knee. “Not really. It’s just him playing well and we’ll see what he can handle,” the coach confirmed.